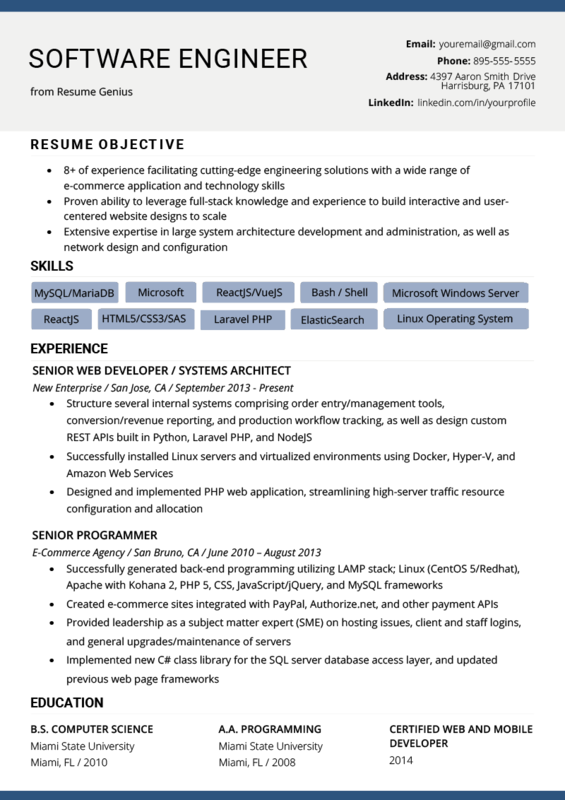 Looking to create the perfect software engineer resume? Use our downloadable sample and expert writing tips below for some guidance. Or, if you’re in a rush, try our state-of-the-art resume builder. Six years of experience facilitating cutting-edge engineering solutions with a wide range of e-commerce application and technology skills. Proven ability to leverage full-stack expertise to build interactive and user-centered website designs to scale. Extensive expertise in large system architecture development and administration, as well as network design and configuration. Structure several internal systems comprising order entry/management tools, conversion/revenue reporting, and production workflow tracking, as well as designed custom REST APIs built in Python, Laravel PHP, and NodeJS. Successfully installed Linux servers and virtualized environments using Docker, Hyper-V, and Amazon Web Services. Designed and implemented PHP web application, streamlining high-server traffic resource configuration and allocation. Developed and delivered high-end website solutions to a diverse client base by utilizing wide-ranging technologies and frameworks. Created e-commerce sites integrated with PayPal, Authorize.net, and other payment gateway APIs. Implemented new C# class library for the SQL server database access layer, and updated previous web page frameworks. Partnered with designers to implement custom web-based simulations for client review. Contributed as the sole programmer in a fast-paced team environment. Designed internal website for agents and management, saving an average $8,000 in labor costs per week. As a software engineer, you possess an impressive array of software development skills with knowledge in mathematics, physics, and other analytical disciplines. You are responsible for creating technically sound and efficient programs uniquely situated at the forefront of a new digital paradigm. With your numerous software engineering skills, languages, and methodologies, you may be asking, “What should I leave in? What should I leave out?” This guide will help you navigate these tough questions. By following our resume hacks, writing your software engineer resume will be easier than it seems. Here are four proven guidelines that will help you debug your resume, get you noticed, and help you land your dream job. 1. Keep your resume to one page. Time is in short supply these days. Hiring managers are swamped with dozens (if not hundreds) of resumes for each job opening. Chances are, a two-page resume won’t be read in full. Under these circumstances, a one-page resume is the most important element of success. Reducing the page length from two to one can be a daunting task. Our guide will help you decide what to keep and remove. The easiest way to reduce document length is to reduce work experience. Good programmers know how to prioritize clear code. The same goes for resume writing. Your goal is to write clear, well-structured sentences that explain the depth of your experience. Do this and you will keep your resume content from mushrooming. Avoid writing more than five bullet points of work experience per position. 2. Clearly list relevant technology skills. Listing skills required for the position is a no-brainer. The trick, however, is to be precise with your relevant skills. For example, if you use Laravel for PHP, but only list PHP, the hiring manager will be left guessing what framework you are familiar with. They clearly state their relevant skills early on in the resume. They show past skill utilization by describing the ways in which they used them. They reference the skills in key sections of the resume, including the summary, skills section, and work experience. On the other hand, be aware that if you show too many skills, hiring managers may assume that your knowledge is too broad and not deep enough to perform at a high level. It will also look like you made the rookie mistake of bloating your resume with skills you don’t have or aren’t relevant to the job. Additionally, you need to show depth in a given language and skill. Reference your skill or language multiple times in your resume. If you’re a C++ prodigy, ensure you mention the specifics about how you employed it in the work experience and resume summary sections. Furthermore, make sure you frame your use of C++ in terms of accomplishments, not just job duties. Don’t show wide skills, focus on core skills relevant for the job. Remember, a resume is not that place to list your entire work portfolio. It is to help you land an interview for one specific position at a time. Still not sure which software skills to include? Our comprehensive computer skills guide can help you make the best impression. 3. Show what you achieved using your skills. In this example, the candidate emphasizes their ability to successfully take on a large-scale development project (including planning, development, and execution). 4. 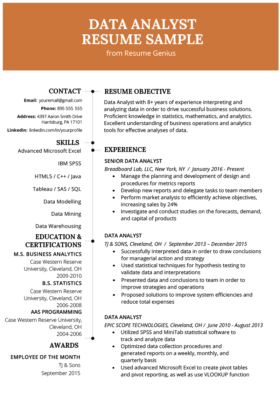 Target your resume for each job application. Targeting your resume for one job at a time is the path to success. This requires a combination of two aspects: researching the company and customizing your resume. Conduct extensive background research on all of the companies you are interested in working for. What are their products? Do you know how these products are designed? What are the technologies behind their products? And equally important, do you understand what the business is trying to accomplish? These leading questions will help you delve deeper into the needs of the company. They will also help you further optimize your resume, and even glean useful nuggets to address in your cover letter or interview. Customize your resume by optimizing your resume introduction and professional experience sections by addressing the job’s needs with your related background. What’s the easiest way to address the hiring manager’s needs? Use the same skill and duty keywords in the job posting throughout your resume—if you can do so legitimately.